Eating of meat is one of the major habits (needs) of population of the planet. Our ancestors cooked meat using various hand tools, the present hostess have a much more convenient tools (though the principle anyway, stayed the same). We will talk about the benefits of modern meat consumption and how to choose an electric meat grinder in today’s article. A meat grinder is a small home appliance for grinding meat and turning it into more or less homogeneous mass – forcemeat. For the question “Who invented the meat grinder?” we can say that the invention of grinder was in the 19th century through the work of german inventor Baron Karl Drais, although some analogues of this device can be found much earlier. It should be noted, that depending on the source of energy used in the operation, there are such types of meat grinders: mechanical (using manual force) and electrical (electricity involved). Let’s concentrate on electric grinder due to current trends. Grinder electric power is one of the main characteristics. The process of meat grinding is associated with fairly large loads both cutting elements and the grinder motor so the power of this device must be greater than, for example, in yogurt machine. Power can range from 250 to 3000 watts in the meat grinder models presented in stores. To be honest: household meat grinder with power less than 550-600 watts can be purchased only if you will not use the device often. It is necessary to look at the models from 600 watts in most cases. 1.0-1.3 kW is the optimum power for this unit. Powerful grinder will greatly facilitate and speed up the cooking process. 2. Case and screw material. Cases of most modern meat grinders are made of plastic. It is better, of course, if the grinder case is made of metal, but it is rare. So just pay attention to the quality of the case plastic. However, the case material is not such important for consumer as the material of grinder screw. Screw is one of the main grinder parts, which acts as a transporter of processed mass and on which are mounted cutting blades. Grinder screw should be all metal. There are options when a screw is metal but his point of attachment to the grinder is plastic, such models are better not to buy. I will say one thing, if you do not want to become a regular service customer – choose a reliable meat grinder in which the screw itself and all contact parts made of metal. 3. Blades and plates properties. Blades and plates, together with the screw are also the main grinder working parts. Grinder blades must be of high quality stainless steel, because they processed meat directly. It is difficult to determine the quality of blades steel, so you can focus your attention on the manufacturer. The famous brand is likely to be used better quality material, although now it is no longer the norm. Material is also important for grinder plates, but more important is the size of the holes. The consistency of the resulting forcemeat depends on the size of the plates holes. Tinier consistency will be received with a smaller holes diameter. Three plates – small, medium and large diameter, which can satisfy almost all needs of the consumer, are included in the grinder kit in most cases. You should look if there are such grids included. Besides the basic functions of meat grinding, electric grinder can be used also for other purposes, for which there are special functional meat grinder attachments. Attachment kebbe maker. Kebbe maker provides a “sausage” that blank inside and can be filled with different ingredients according elected recipes. By the way, these “sausages” are delicious with bread. Attachment for cutting into cubes. Mainly used for cutting vegetables into cubes for a variety of salads. Attachments for shredding. Also mainly used for cutting and shredding vegetables. There are many other additional grinding attachments for the grinder, but they are rarely mentioned. In addition to the above: when you will make the choice of grinder you will need to know about the existence of such functions as the reverse. A reverse function is a possibility of rotation of the screw in the direction opposite to the basic direction. Reversible movement helps to clean meat grinder indiscriminately in the event that there is something stuck (like tendons). Also, it is useful to inquire about the availability of such thing as a meat pusher. Common table grinder is a useful device but it can be quite dangerous. So stick your fingers into the device and push meat with them is forbidden – there is a special pusher for this purpose. Manufacturers tries to supply the meat-pusher in most cases, but once again test its presence can not hurt. 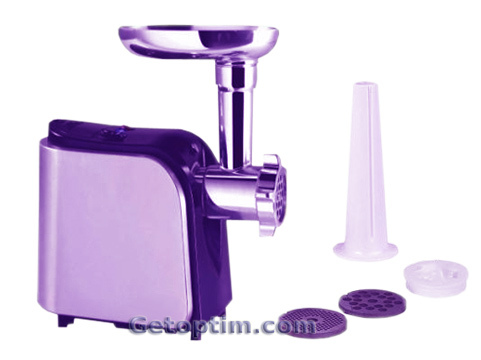 I wish you to buy the best universal home meat grinder and enjoy working with it.